I wanted to do something off the beaten path for this month’s vampire theme, so I dug deep and found vampiric creatures from the ancient Aztecs: Cihuateteo. 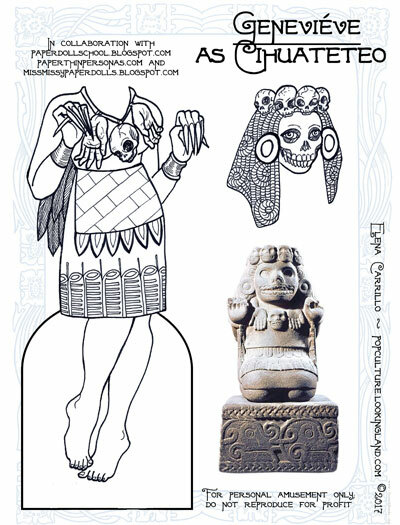 Cihuateotl is truly a gruesome figure (as many Aztec deities are). She represents the spirit of women who die in childbirth (hence the crown of baby skulls and the one around her neck). She preys on women and children, stealing babies and causing their mothers to go mad. Basically not a pleasant creature nor one you would want to invite to tea. I based my costume here on a bit of statuary (which I included for reference) with some embellishments and liberties. Instead of the typical Aztec stylized skulls, I made them a bit more naturalistic. I never think about doing a Christmas-themed set of plates until it’s too late to actually be planful about it. I need to start in January and then maybe I can actually be ready by the time December rolls around. Even starting late, I thought: oh, no problem! I’ll do a 12 Days of Christmas thing so that the posting doesn’t have to start until December 25th. So I started mapping out this idea of doing a Beauty & the Beast theme and each day would be a new costume and a new set of gifts, but last week I realized I would never be able to draw, color, and plate them in time–not with all the holiday ruckus going on. As a consolation, here’s what I started. Decided at the last minute to leave it as a “cut and color” set since that might be more fun with only a single plate. I did color the figures, though (I didn’t scan them before I made the decision). I like Beast. Not so sure about Beauty. She’s okay, I guess. I really didn’t mean to make her blonde, but…oh well. Maybe if I revisit my 12 Days of Christmas idea, I’ll revamp her. I’d like to revisit this. Beauty & the Beast is my favorite fairy tale, but I’ve never liked that Beast turned into a “handsome prince” at the end of it. He is a handsome prince–just the way he is. And yes, in my mind, I always imagined him more wildebeest-warthoggy than cat or bearlike. With hooves instead of claws. Beastly for his manners more than anything else. In an early version that I read, one of Beauty’s first kindnesses is to feed him at the dinner table. He can’t hold a spoon and is ashamed of sticking his face in the bowl. That always stayed with me. So be kind this season–especially with all the grumpy frustrated people you meet in the stores and on the streets: they need it the most. This is my last set of plates for 2016. 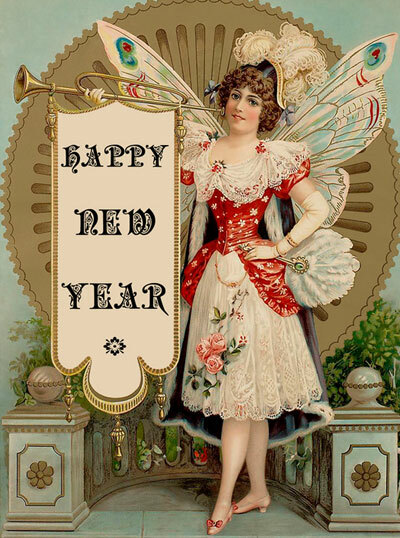 Looking forward to lots of new stuff in the coming year! I’m going to make 2017 great and I hope you will too. I wish you all the happiest of holidays, with much peace and joy and inspiration! My original goal with the Fear the Walking Dead zombies/infected was to build a whole army of these scary things over the course of the show. I was specifically choosing the ones who had names. There were plenty of other crawlies in Season One, but they were all nameless munchers. I wanted to try to keep the monsters more personalized. I was fairly slavish about detail on this series. There was plenty of reference to work from. I had to improvise some (like Kimberly’s shoes–we never see her feet). Otherwise, I tried to make things pretty accurate. Season Two concluded a couple of weeks ago. Given that I didn’t finish Season One, it’s not likely I will pursue this. The show is okay–it has its moments, but it’s lost its new car smell in terms of making paper dolls. I may yet finish some of the dolls. Liza and Nick are done; Travis, Madison, Ofelia, and Daniel are kinda half-done. The rest I drafted, but never painted (Chris, Alicia, and Strand). It’s doubtful I will go back to those. So last/not least: meet Susan and Kimberly. 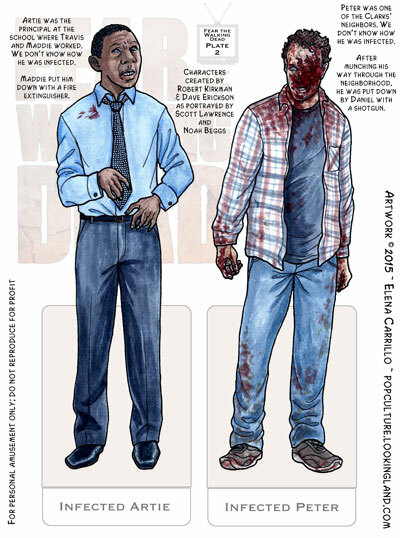 Last fall, I worked on a whole series of paper dolls for the AMC spin-off Fear the Walking Dead. I did a lot of work, but I didn’t finish. It wouldn’t take much to complete the dolls I’ve actually drafted, so I might: just to make sure I don’t drop stuff like this regularly (it’s a very bad habit). I wouldn’t want zombies to come eat my brains for not following through. So for Halloween over the next three days I thought I would post the Season One zombies. Oh, I forgot, we’re not supposed to call them “zombies”, they’re “infected”. Whatever. I made six infected characters (all the ones we have names for in the series). They aren’t really paper dolls so much as cut-outs since they don’t have outfits or accessories. But they are great companion pieces and I had waaaaay too much fun making them. I like ghoulish things, but totally understand if this is too much for you, gentle readers. You might want to skip the two posts that follow as it will be more of the same. I promise November will be a kinder month with prettier dolls ~ ha! For today: meet Gloria and Calvin. The last year has been crazy, but I’m happy to have this blog running and to be back to posting paper dolls. Lots of stuff coming for the New Year and I’ve tried to figure out a schedule that makes sense. If I post three days a week, I’ll burn through my buffer quick, but I have at least four series I want to start sharing soon! 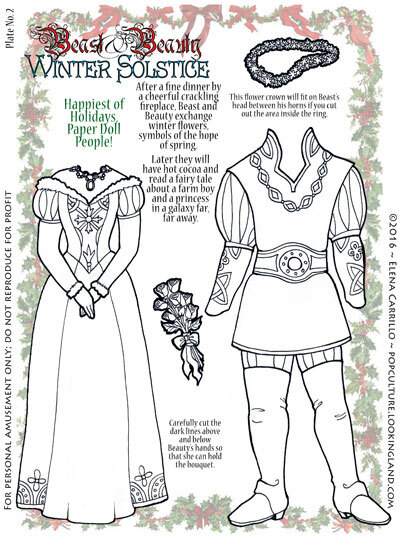 Monday Mayhem: comic book-themed paper dolls in full color. Starting with villains Harley Quinn and the Joker (hence the mayhem). Judy Tuesdays: continuing the black & white series until the volumes run out, which will be a nice long while. 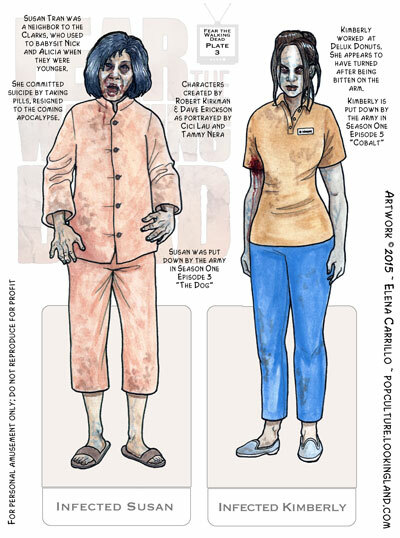 Fear Fridays: zombies and the people who don’t love them. 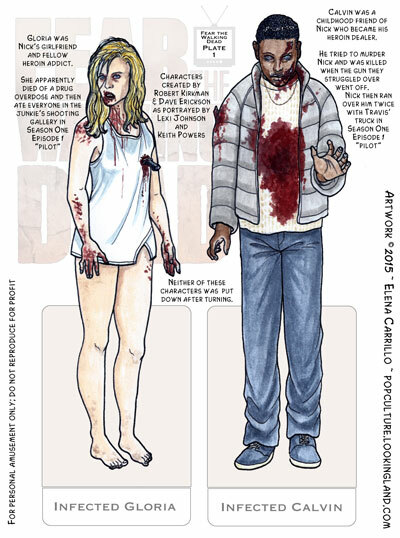 Have two black & white plates of The Walking Dead left to post, then lots of full color Fear the Walking Dead to come. Still a weird set of plates, but I’m following through to the end. Right now the outlier is Empire, for which I don’t have a catchy day name. I’m also behind on it compared to the others, though I really love how it’s coming out (great material to work from!). Might stall posting it until I can figure out where to put it. I continue to look for ways to simplify (in my monumental laziness). Painting is a challenge not so much for the labor, but mixing colors has been hard since I’m not making up my own color palettes. 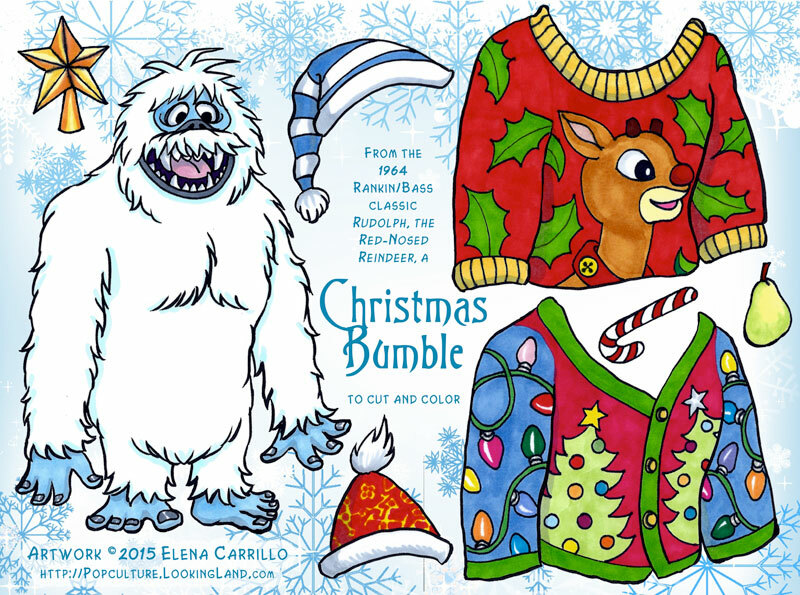 I’ll continue to paint the series I’ve already started, but having really enjoyed coloring with markers for the Christmas Bumble and comic book stuff, I might do more of that for some series in the near future. Still have my eye on the X-files (new mini-series starts in January), and I’ve always wanted to go back to Quantum Leap because the costumes are awesome and weird on that show. I’d really like to do something quick and fun that’s not tied to a specific series and has a more general appeal (my tastes are skewed). 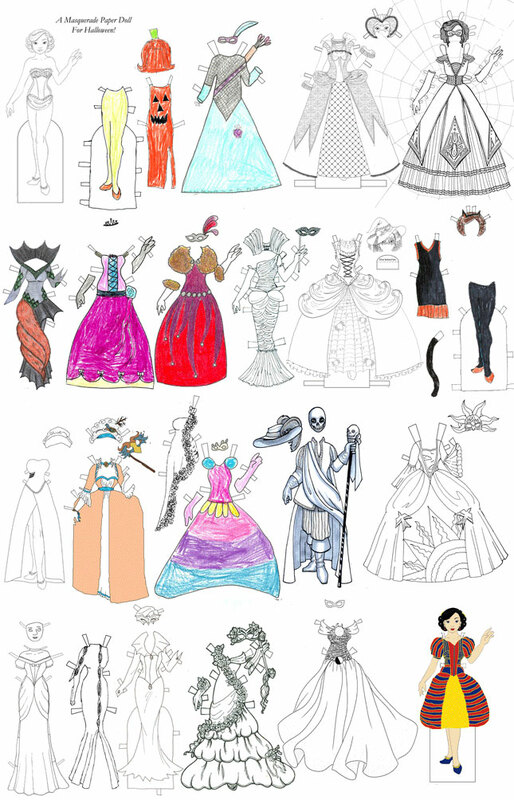 And/or at some point in 2016, I’d like to work on historical paper dolls (aside from Judy, and in full color). While I absolutely love working from great source material, I feel like I need some original paper dolls in the mix. I like to cheat by reproducing other people’s designs, but I miss making up my own stuff. Some extra bits and bobs for Mr. Bumble. 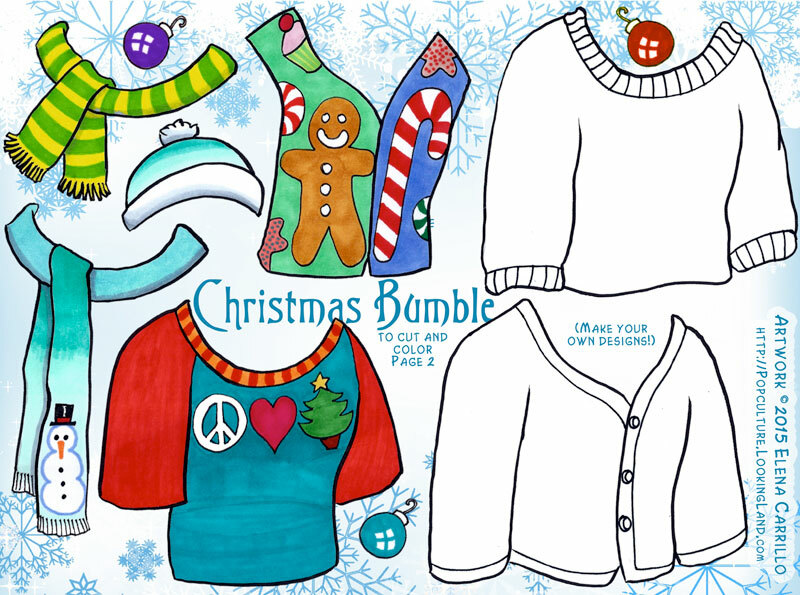 I have included two “blank” sweaters for you to design and color for yourself. Not because I’m so outrageously lazy (even though I am), but because I thought it would be a nice extra bit of activity business. I don’t have a lines-only (to color) version of this page. I forgot to scan the linework before I colored it and there was just no going back (that’s one of those disadvantages to working in real media instead of digital). Hope you enjoy this anyway, and celebrate your holiday as you most hope to! Merry Christmas/Happy Holidays all! I couldn’t resist the urge to make at least one small Christmas paper doll. 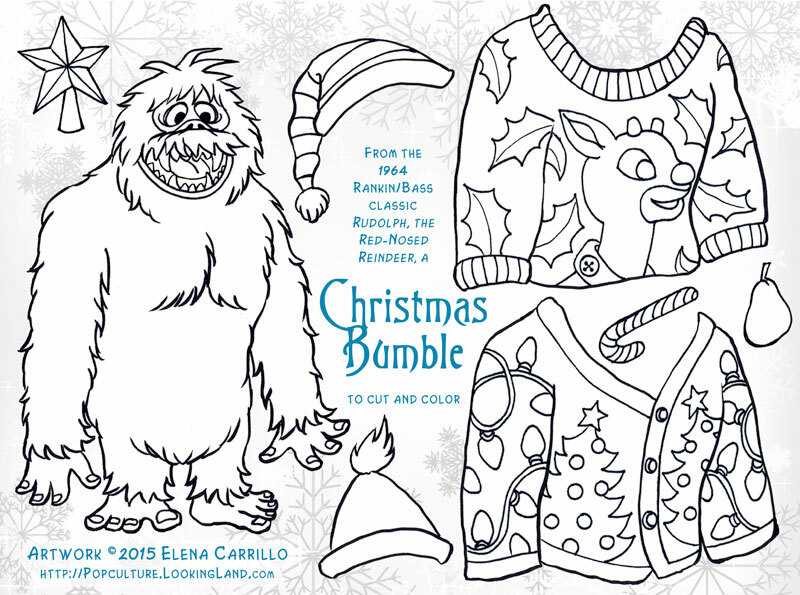 The ubiquitous ugly sweater seems like a perennial favorite, so figured I would make poor Mr. Bumble suffer the indignities. Well he looks happy, anyway. I made two versions of this: this one to print in black & white so that you can color it for yourself, and a second one which I colored for you. I’ll post the colored version next week. Hope you enjoy this as much a I did making it! Some years ago, we did a Halloween Paper Doll Round Robin that was so much fun that Rachel decided to throw another one ~ and this time open it up to the readers as well. This year Julie from Paper Doll School created the doll and Rachel from Paper Thin Personas did the heavy lifting on the wrangling and organizing. We had so many great submissions that it was decided to split them into three pdfs. Thank you to everyone who participated. It’s so awesome to see this level of engagement! 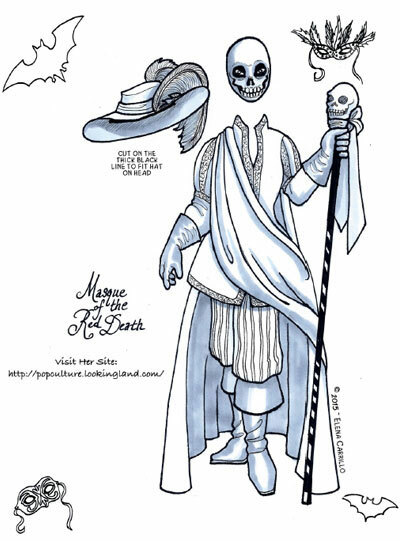 In the batch you download from this site, you will find: the Masque of the Red Death (my own contribution, shown above), a gown from Corpse Bride by Gena, Spider Queen from Irma at Papernukublogi, Cat and Pumpkin costumes from Melinda (in color! ), a Vampire by Melissa Smith at Miss Missy Paper Dolls, and a Sun/Moon gown from Liana at Liana’s Paper Dolls. If you’re staying in this evening and want to watch a scary movie, I recommend you pick up The Changeling (1980) with George C. Scott, or The Innocents (1961), with Deborah Kerr. Both are classics. If you want something a little more modern, get yourself An American Werewolf in London, or The Thing (1981 & 1982 respectively ~ and classics in their own rights). Something more obscure? Try the underrated Dolls (1987). If you can’t bear to watch anything made prior to the turn of the last century, then pick up Pan’s Labyrinth (2006), Orphanage (2007), or the excellently terrifying [Rec] (also 2007 ~ the Spanish version, not that silly American remake). These are all movies that prioritize story over gore and are full of genuine frights. Not for the kiddies, though. Best to stick with the old standbys like The Great Pumpkin. Enjoy all of your Halloween treats! And the tricks too, if they are good and fun!